to me! 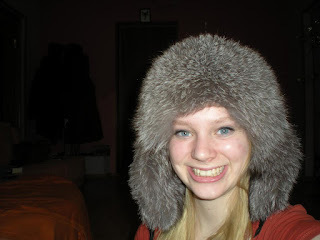 I bought myself a fur shapka. We all knew it was coming. It is a little ridiculous, but I am after all in Russia. After a healthy dose of buyers remorse (which I knew was coming, I ended up buying it after wandering around the market for waay too much of dinner time and coming back to an acceptable one and asking them to knock it down 500 rubles) I have decided that I like it. And it will keep me warm. I'll send a picture if I figure out how, I'm on an unfamiliar computer today. New Year is the big holiday here, so we were confined indoors for that night, and now lots of things are fully or partially shut down until next week. So I'm not writing from the usual place. 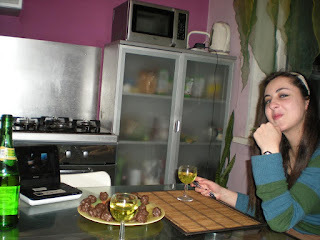 On New Year's eve we only really declined to drink wine (I don't know if that investigator has really understood anything we taught) and did some cooking and cleaning, so- not the usual. I might have danced to an EFY song. That's about as crazy as it gets. Before we went to bed I idly wondered if we would wake up at midnight. I shouldn't have asked. The city pretty well exploded. It sounded like the loudest bag of popcorn was in the microwave. These people love their fireworks. Also, every dog in Orenburg was barking. This went on for at least 45 minutes. When we hit the streets at 7 am the next morning there was no one to be seen, and still the occasional sound of a firework. Yesterday we woke up to a foot or so of snow, and in our small sleepy city on the Sunday morning after New Year there's no shoveling, plowing, etc (also almost no buses). We waded and floundered through the snow (piled thigh-high by the wind in places) to church and were very nearly late. Fortunately, so were the few other people who turned up. I'm starting to understand why the inactivity rate in Russia is so high. We lose 'em all in the winter. I don't know if Orenburg is actually in Siberia, but the winds are referred to as "siberian", and when the wind blows it feels like someone took a metal pan out of the freezer and placed it firmly on your face. No one wants to meet right around New Year and when it gets cold outside people are pretty reluctant too. "Girls", they say "it is so cold and snowy! You should not go outside! So I'm going to have to cancel our meeting". I've tried explaining that we can either be in a meeting with them, or we can be out on the street, but no one really gets it. So sometimes we just show up to people without warning. I've been studying about humility a lot. It's easy to forget about if we think we know what we are doing! It's kind of stupid to think we're smarter than God, though. You can't let people walk over you, but it's so important to listen to and seek correction. Like that conference talk...oh I forget who's. But we can let God mold us into much better than we can make ourselves. Of course, the one week I actually take pictures is when I can't figure out how to upload them. Next time! I love you all! Stay safe and happy! (Note: Rosa didn't give a lot of context for the first picture, but she said it's "kiddie champagne and glasses courtesy of their apartment", so I assume it's Sister Palmer on New Year's. And the second is of course her new shapka!